The Champion™ pET Expression System yields the highest-level protein production in E. coli. During expression, your protein of interest can reach levels greater than 50 percent of total cellular protein. Based on T7 expression vectors originally developed by Studier and colleagues (1-3), high-level expression is achieved because the T7 RNA polymerase is more processive than native E. coliRNA polymerase and is dedicated to the transcription of your gene of interest. Protein production is further enhanced in the system by the expression strain BL21 Star™ E. coli, which significantly improves the stability of mRNA transcripts and increases protein expression up to ten-fold. Seven Champion™ pET Directional TOPO® Expression Vectors are available (Figure 1 and Table 1): Each vector carries a T7lac promoter for high-level expression. Flexible options for simplifying protein detection, cleaving purification tags, selecting plasmid carrying clones, and/or improving protein yields are available. With the Champion™ pET Directional TOPO® vectors you can expect highest-level protein production. Figure 2 shows expression of the lacZ gene in Champion™ pET Directional TOPO® vectors. 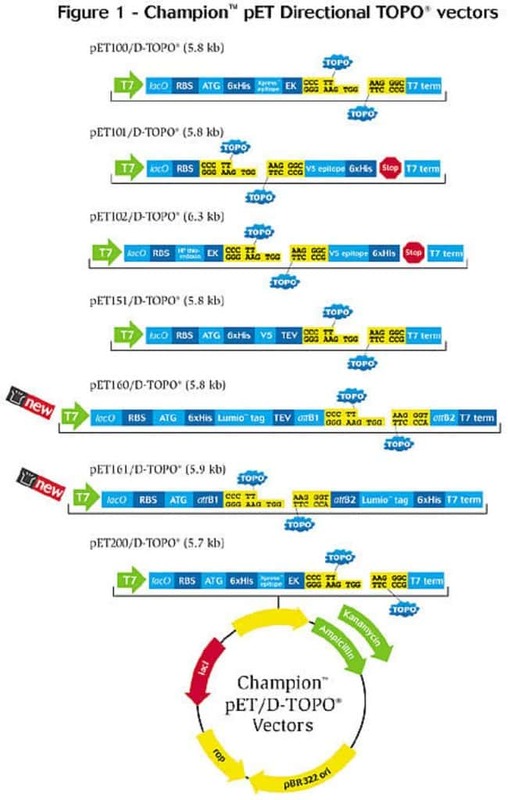 Figure 3 demonstrates efficient cleavage using TEV protease of the N-terminal tag of a β-galactosidase fusion protein expressed from pET151/D-TOPO®. Each Champion™ pET Directional TOPO® Expression Kit is provided as a complete expression system. The Directional TOPO® Expression box contains 200 ng of linearized, topoisomerase I-activated Champion™ pET vector; sterile water; dNTPs; 10X PCR Buffer; salt solution; control template and primers; primers for sequencing or PCR screening; and an expression control. Store at -20°C. The One Shot® TOP10 box contains twenty-one 50-µl aliquots of chemically competent E. coli, S.O.C. medium, and a control plasmid. Store at -80°C. The One Shot® BL21 Star™(DE3) box contains twenty-one 50-µl aliquots of chemically competent E. coli, S.O.C. medium, and a control plasmid. Store at -80°C. Kits with Lumio™ Technology include 20 µl of the Lumio™ Detection Reagent. Store at -20°C. Guaranteed stable for 6 months when properly stored.